Rutgers tree fruit breeder Dr. Joseph Goffreda, director of the Rutgers Fruit & Ornamental Research Extension Center in Cream Ridge, NJ, won the 2015 Inventor of the Year Award for breeding a hybrid peach with highly desirable characteristics. This hybrid peach is resistant to environmental adversity and has advanced fruit quality, thus enabling New Jersey to be a leading state in peach production. 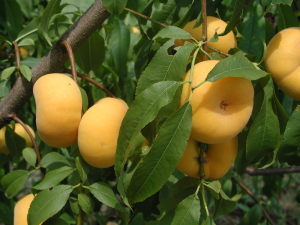 Traditionally, the market has hung its hat on yellow-fleshed peaches, said Jerry Frecon, a Rutgers University emeritus professor and horticultural consultant to Adams County Nursery of Aspers, Pennsylvania. 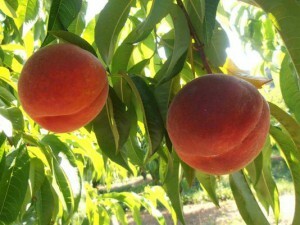 …Frecon said there are plenty of new peaches and nectarines being developed. Many in the Mid-Atlantic states are coming from Rutgers University’s Tree Fruit Breeding Program, under the direction of plant biology and pathology professor Joseph Goffreda, at Cream Ridge, New Jersey.